Chardonnay vine selection 4 has been widely planted in California for many decades. 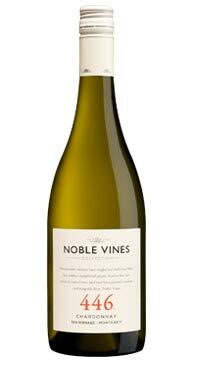 It is an expressive vine type, offering a wide range of Chardonnay flavors including the typical green apple and citrus, but also tropical fruit such as pineapple, coconut and mango that distinguishes California’s vine type 4 from the Chardonnay variations grown in France. With cooling afternoon breezes, evening fog and a long growing season, Monterey is perfect for growing excellent Chardonnay grapes. Clone 4 does especially well in Block 46 at our vineyards in the San Bernabe sub-appellation of Monterey, one of the coolest growing regions in California. Hence, the designation “446” on the Noble Vines label. The grapes are crushed at the winery that was built right in the vineyard. Building a winery so close to the grapes underscores Noble Vines’ commitment to preserve the superior qualities produced by its excellent vine stock. 446 Chardonnay exhibits appealing aromas of ripe pear, pineapple and melon. Medium-bodied with a creamy mid-palate, this delightful wine offers flavors of peach and coconut, with hints of lemon and toasty vanilla spice. Enjoy this wine with friends, on its own or with soft cheeses, seafood, salads, pasta in wine or cheese sauce, or roast fowl.